DENVER, Colo. (June 10, 2014) – Volunteers of America, one of the nation’s largest and oldest human service organizations, presented former Colorado First Lady and current Denver Post columnist, Dottie Lamm, with the organization’s 2014 Empathy Award in recognition for her tireless efforts promoting women’s issues in Colorado. The Empathy Award honors news organizations and journalists for outstanding community service and excellence in reporting about social issues. Lamm served as the first board president of The Women’s Foundation of Colorado. As Colorado’s First Lady (1975-87) she initiated and chaired the Governor’s Task Force on Children and was a member of the Governor’s Commission on Women. Lamm currently serves on the Foundation Board of the Rocky Mountain Farmers’ Union and the Capital Campaign Committee for Planned Parenthood of the Rocky Mountains. Volunteers of America’s Empathy Award was first given to the Chicago Tribune in 1995 for a crusading series on violence against children. Other recipients have included “Dead Man Walking” author Sister Helen Prejean, national columnist E.J. Dionne, Washington Post editor Colbert I. King and CNN. Approximately 600 Volunteers of America leaders and care providers from across the United States travelled to Denver for the organization’s 2014 National Conference on June 7-10. In the Denver area, Volunteers of America Colorado Branch serves approximately 5,500 people a year in more than 50 programs in 18 communities statewide. Clients served include homeless veterans, seniors, those with disabilities, people recovering from addiction and low-income families. 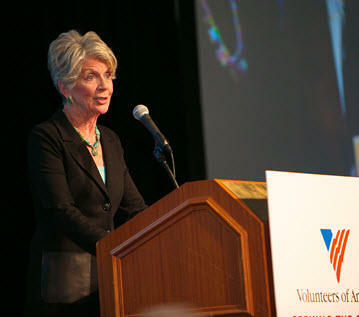 Volunteers of America is the charity that always steps forward to help the most vulnerable. Founded in 1896, Volunteers of America is a national, nonprofit, faith-based organization dedicated to helping those in need live healthy, safe and productive lives. Through hundreds of human service programs, including housing and health care, Volunteers of America touches the lives of more than 2 million people in over 400 communities, including veterans, seniors, people with disabilities, at-risk youth, men and women returning from prison, homeless individuals and families, those recovering from addictions and many others.